LAUREL – DNREC’s new state-of-the-art mobile science laboratory, “Science at Your Door,” was unveiled today at North Laurel Elementary School in a ribbon cutting ceremony led by Governor Jack Markell, DNREC Secretary David Small and Secretary of Education Steven Godowsky. They were joined by Laurel School District Superintendent Shawn Larrimore, EPA Region 3 Administrator Shawn M. Garvin, North Laurel Elementary School Principal David Hudson, local officials, teachers and scores of 3rd graders, eager to explore the lab’s interactive science programs that feature watershed and ecosystem education. The mobile science laboratory is part of Gov. Markell’s Children in Nature initiative that’s increasing opportunities for youth to take part in outdoor and environmental science activities both in school and out of school. Back row, left to right: Dept. of Education Sec. Steven Godowsky; DNREC Sec. David Small; Gov. Jack Markell; EPA Regional Administrator Shawn M. Garvin; Laurel Schools Supt. Shawn Larrimore; Will Koth, Division of Parks & Recreation educator interpreter, Trap Pond State Park, and Dr. Jonathan Wickert, chief of interpretation, Delaware State Parks. Front row, l-r: Laurel North Elementary School students Zamaya Horsey, Zoe Gianacopolis, Brandon Adkins, and LaTonn Palmer. “Science at Your Door” provides learning opportunities where students can experience first-hand, through observation and exploration, important scientific relationships and how personal decisions impact the health of the environment. The laboratory improves environmental literacy and increases student diversity and access to science and nature experiences – two goals shared by the Delaware Children in Nature initiative and the Chesapeake Bay Agreement, the document signed by Gov. Markell and five other governors in 2014 that sets goals that protect and restore the Chesapeake Bay Watershed. The curriculum was developed by DNREC and the Delaware Department of Education to meet the Next Generation Science Standards and supports the Delaware Environmental Literacy Plan. The laboratory also supports STEM (Science, Technology, Engineering and Mathematics) Education in Delaware by familiarizing students with environmental professionals and subjects that will help prepare them for college and potential careers in STEM fields. DNREC Secretary David Small, Jonathan Gianacopolis, Laurel North Elementary School teacher and Gov. Markell talk with North Laurel 3rd graders about the new DNREC Mobile Science Lab and Children in Nature initiative. 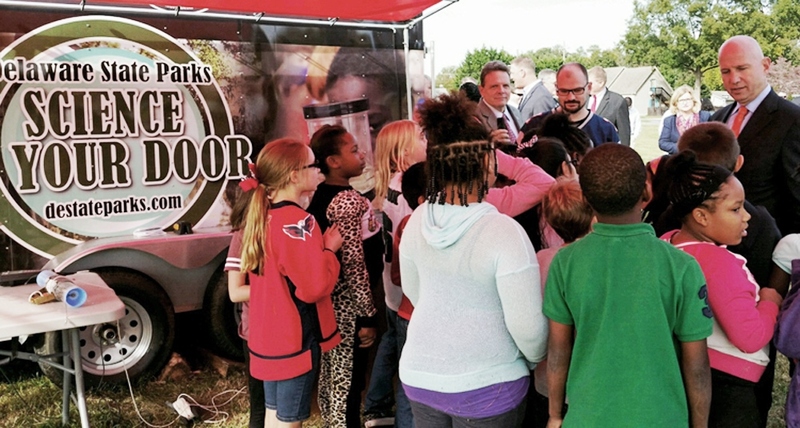 The mobile science laboratory will travel to schools in Delaware’s Chesapeake Bay Watershed, including Laurel, Woodbridge, Seaford, and Delmar School Districts and other individual schools located in the watershed. More than 2,000 students in kindergarten through high school and their science teachers will be enrolled in the “Science at Your Door” program during the 2016 -17 school year. Future plans are to expand the program to serve other schools located in the Delaware Bay, Piedmont and Inland Bays Watersheds. The Power of Water – Students discover how mass and velocity affects the energy of moving water. Erosion and water pollution are used to illustrate the concepts. pollution. Students learn how stormwater runoff caries pollutants through the watershed and the best management practices to prevent runoff pollution. Waters of the Chesapeake – Students follow an imaginary water drop from Trap Pond to the Chesapeake Bay. The program includes exercises in outlining watersheds and a brief introduction to water quality testing, including pH, nitrate, phosphate, dissolved oxygen, and turbidity to show the important of water management and pollution control. In his remarks, Gov. Markell spoke about the thousands of public school children who have benefited from the Children in Nature initiative and highlighted some of its significant accomplishments over the past 2 ½ years. These included programs such as DNREC’s Youth Conservation Corps that’s providing environmental opportunities and summer jobs for teenagers, and Healthy Kids Days, a partnership among DNREC’s Division of Parks & Recreation, Nemours Health and Prevention Services, and the Department of Health and Social Services to encourage kids to make healthy lifestyle choices. Other notable successes are the creation of schoolyard habitats at Seaford and Caesar Rodney School Districts that serve as outdoor classrooms, 23 vegetable gardens at schools, providing education and healthy food, and numerous environmental-based programs and field trips to nature areas and parks. The laboratory is collaboration among DNREC’s Divisions of Parks & Recreation and Watershed Stewardship and the Department of Education to provide scholarship-funded science education to students in Delaware’s Chesapeake Bay Watershed. Funding for the mobile science laboratory, supplies, and student/teacher scholarships was provided by DNREC’s Division of Watershed Stewardship through EPA’s Chesapeake Bay Program. For more information on DNREC’s mobile science trailer, contact Dr. Jonathan Wickert, Chief of Interpretation, DNREC Division of Parks & Recreation at 302-739-9184 or William Koth, Interpretive Programs Manager, Trap Pond State Park, DNREC Division of Parks & Recreation at William.Koth@delaware.gov or 302-875-5163.